Uftring Pekin Has 2018 Jeep Wranglers! WHY BUY FROM UFTRING IN PEKIN? What is it that makes us Jeep fans? There are many factors. For starters, the off-road capability. There isn’t another vehicle that is more well-known for it’s ability to hit the hills than the Jeep. Its amazing combination of ground clearance and 4WD go unmatched. Another great factor has to be its dignity gone hand-in-hand with variety. Jeeps are SUVs. They don’t try to be anything else. But given the fact that there are over five different models to choose from shows dependability on another level. They suit any lifestyle. When you think of a Jeep, what do you picture in your head? 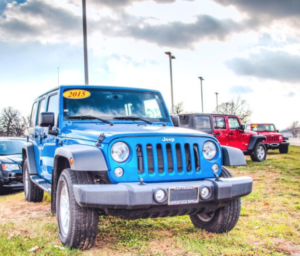 You probably picture a Wrangler, the original of the series of dependable SUVs. But, what specifically causes you to imagine a Wrangler? It’s that classic seven-slot grille with the round headlights. Now, if you look at other Jeeps that have lived on the Wrangler’s legacy, you’ll notice that the timeless feature that never goes unnoticed is on every single one. The seven slot grille is a timeless amenity that fully represents the Jeep brand. So, why are there seven slots? The original Jeep that was designed for WWII in 1940 had nine slots on its grille. There are many different conspiracies as to why, including that it was designed to be a multi-purposed surface that could be used to grill hamburgers as well as hold together the front of the Jeep. Although there is no telling now if that is true or not, it is an interesting anecdote. It wasn’t until 1945 that the Civilian Jeep was released and sported seven slots in its grille. From then on, the Jeep has and will always (it’s implied, at least) have the classic grille with, not nine, not eight, but seven slots. The question still remains, however, as to why the Jeep’s grille has seven slots. Could it be that seven people worked on the original Civilian Jeep in 1945? Or, maybe it took seven months or years to build/create? One “fan theory” that Jeep lovers have is that the Jeep was the first vehicle to drive on all seven continents before any other one. It’s a pretty solid theory given that the Jeep was originally a war vehicle. Some people, however, like to think that the seven slots just looked better than nine. The other theories might just be a happy coincidence. Whatever the case may be, it’s fitting to put such an imaginative backstory on such a well-renowned, reputable brand. Does all of this talk of seven slot grilles make you want to drive a Jeep? 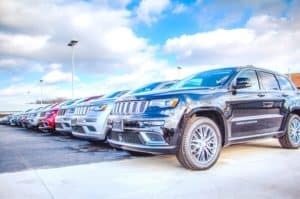 Visit Uftring in Pekin, your Jeep dealer in the Peoria area, and test drive one today. Or, click here to shop around! Uftring Chrysler Dodge Jeep Ram	40.6228532, -89.6215027.